We spoke to Paul Manning, chairman of City of Liverpool FC, about how the city’s new team are making waves at the bottom of the football pyramid and converting a few LFC fans along the way. City of Liverpool FC, who were founded in 2015, currently lie second in the Hallmark Security League Division 1 on the tenth and lowest rung of England’s football league pyramid. That they’re challenging for promotion in their first season is an achievement in itself, but the club wouldn’t have expected anything less. 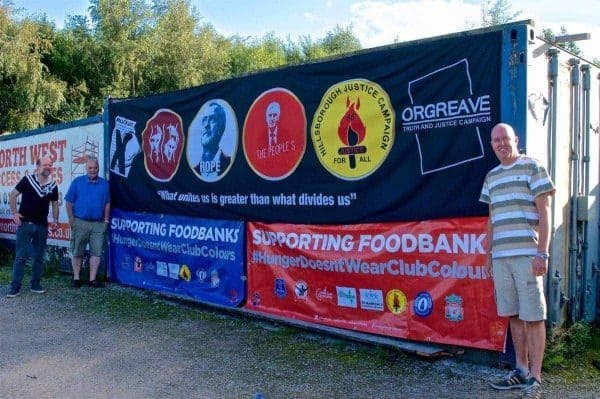 They’re an organisation whose aim is to be successful on the football field, and give something back to the less fortunate people in the city of Liverpool. As well as the Purple Partisan supporters group which is mentioned below, the club also encourage international support through their Brigade Internacional. The Brigade already has supporters from all around the world, as far away as the USA, Canada, and Australia, as well as from the Scandiavian countries — Norway, Denmark, and Sweden — which have historic ties with the city of Liverpool. We interviewed Paul back in October 2015 when the club was still in its embryonic stages, and now, with the club’s first season reaching an exciting finale, he gives us the lowdown on the fans, the club, and plans to move to their own ground in the city centre. Even though you’re barely one season in, would you say City of Liverpool FC supporters have already found their own identity, and do the fans have any unique traits, songs, or customs? There is no doubt that The Purple Partisans have found their own identity! 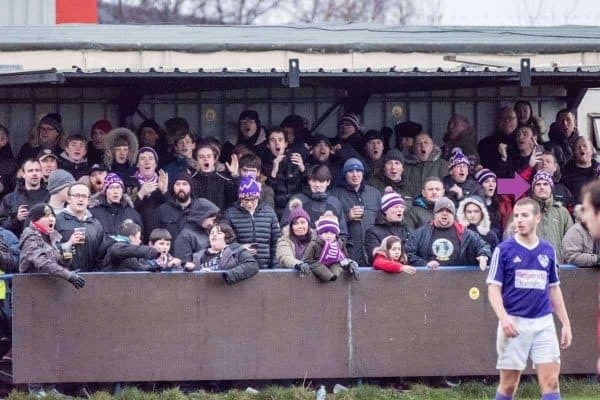 From the first game at Prestatyn right through pre-season, our merry band of men, women, and children has solidified and grown into an homogeneous group of people roughly 350 strong. Some of this has been moulded by the club (such as the creation of the Partisan List – think the Match Credits scheme at LFC but in reverse! ), but so much more of it has come naturally and been instigated by the supporters themselves. For example in an early game, one of the Partisans John Joynt was just shouting out “Purple Partisans” repeatedly, I latched on to that and named the Partisan list after it, another club Director drew a “Purple Partisans” logo and the rest was history. The Purple Partisans were born and now have several sticker designs that get plastered all over the place. There are flags, banners, and songs, and because it’s all organically done, not forced or manufactured, it feels fresh and fun and people are just enjoying it for what it is — making the match funny again. 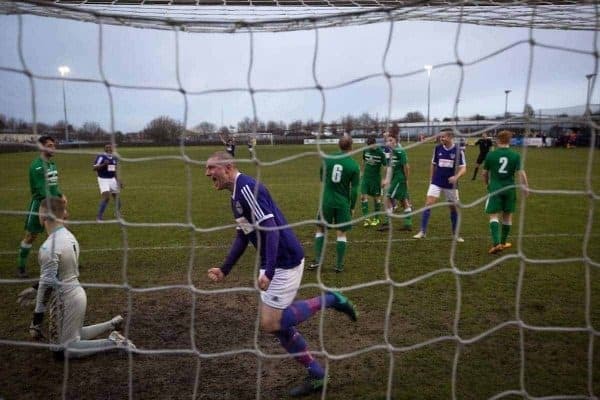 In our first home league game, we scored two injury time goals to win the match, and just by pure luck another Partisan, Jason Morland, captured both the goals and the reaction on video. Those two videos went viral and people quickly realised that something was happening at COLFC. It encouraged other people to come along and enjoy the football again and the rest, as they say, is history! Are there any instances of disillusioned fans of the city’s Premier League clubs adopting City of Liverpool FC as their new club, or do fans tend to support the club as a second team? There are loads of people who have completely ditched both LFC and EFC now that a viable and cost effective alternative is available. People have become completely addicted to football in the Hallmark Security League Division One! Exotic but mostly unheard of places like Whitchurch, Eccleshall, Prestwich, Hanley, Chadderton, Bacup, & Silsden are suddenly front and centre of people’s plans – it’s astounding – and it’s not just when we are playing them either. People are genuinely engrossed by thought of Charnock Richard playing Sandbach United on a Tuesday night in February and what it means to the league table! 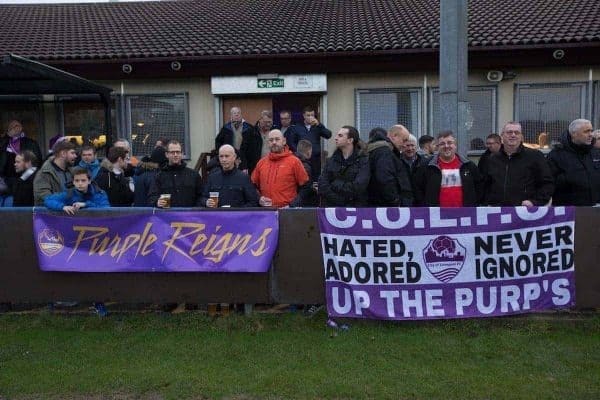 On occasions when COLFC have no game or have a game postponed due to weather, Purple Partisans frequently pop up at the matches of other teams. Against that I’d say that for a large minority of our supporters Liverpool FC and to a lesser extent Everton FC are still the priority and COLFC is happy alternative when fixtures don’t clash. We lose about 75-100 off our gate on the occasions that we have directly clashed with LFC (twice so far) and about 40-50 when we clash with Everton (four times). We’ve done our best to accommodate people where we can. For example, putting a coach on to Anfield immediately after our game v Alsager at home, so people could get up to LFC for a 5.30 kick-off. In reverse we put a coach on from Anfield to get people down to the Delta Taxis Stadium for a 3pm kick-off, after LFC kicked off at 12.30 recently against Wolves in the FA Cup. So overall, it’s a bit of both really! The club’s COLlective scheme aims to help local organisations improve, harnessing the spirit of City of Liverpool FC’s community owned ethos. Would you say the results of this scheme are as important as those on the pitch? The whole project: City of Liverpool FC is a massive balancing act, where several pieces of the jigsaw are all in play at once and all as equally important as the other. I think in all honestly, the results on the football pitch in this, our first season, have taken priority so far. In order to keep attracting people to come and watch us we have to have the match-day experience being enjoyable – the football has got to be good, the atmosphere engrossing, the beer nice, and the food enjoyable. All of those things have to be good, otherwise the whole thing is a bit pointless. If people come once or twice and it’s all a bit dull and crap and they don’t come back again. Our attendances buck the trend which usually sees a new club have big initial attendances and then people don’t come back and the attendances fall away. Our attendances held steady over the winter months and we are hoping (expecting!) that with the team pushing for the title / automatic promotion / play-offs, and the better weather that the Spring brings, that our crowds will go up. Running a club at this level of football is an all-consuming task and with us being new to it, relatively speaking. It took all of our attention and we haven’t done as much with COLLective as we would have liked, but we recently made good on our commitment to sponsor the Edge Hill JFL and that is a big step forward for us. We will be supporting over 400 kids who play in that league with a range of things from coaching to gifts and having our players and committee members on hand every Sunday morning to help out with anything that needs doing, and to just give something back for the community. We expect to sponsor other leagues as we move forward as well to support as many junior footballers as we can. Our sponsorship of the league will help them update their kitchen facilities at Botanic Park, which in turn will help them become more self-sufficient and we think that is great. Though the club have been playing their home games in Bootle, at the Delta Taxis Stadium, is there a long term aim to have a home ground in the Liverpool city area? Never mind long term aims! There is a short term aim to build our own ground in the City, and work is well underway on the project to locate and secure land that can house a stadium we can play on “now”, but that can also be developed as we hopefully grow. There is a page on our website dedicated to this project which contains a lot of information and also features videos of project lead Peter Furmedge discussing our aims in a series of videos. Creating a community stadium in our own City is a key strategic target of ours and one that we fully expect to make a reality. 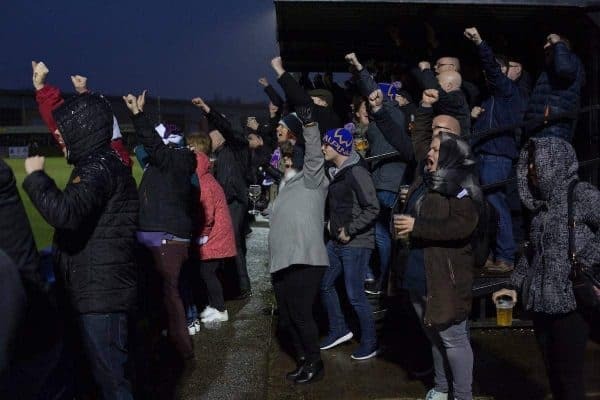 We are estimating that ground sharing is costing us something along the lines of £100,000 per season in lost revenues, mostly from the Purple Partisans love for drinking beer, and we are keen to get them drinking our beer as soon as possible. What have been the highlights from the first season, and what do you hope to achieve as a club in the next year or so? Playing our first ever game at Prestatyn. The culmination of 2 years work. The equalising goal at Prescot Cables in pre-season. A proper match let off! Coming from 2 goals down in injury time to beat Bacup Borough 3-2 in our first home league game — another mad let off. Beating Litherland Remyca 3-2 at their ground. Always nice to win your derby. Prestwich Heys away in the cup and two late goals see us through. Beating Whitchurch Alport 2-1 away in November in a game billed as a title decider — in November! Beating Holker 6-1 in front of the Sky Cameras and learning we had gone top of the league after the game. The bar that night was amazing. Just generally seeing people marching up to the gatehouse to watch us play. I love seeing the crowds arrive and seeing so many familiar faces from 20-30 years of watching LFC as they bring their sons, daughters, granddads or whoever into a COLFC match with them. This season we hope to win promotion to the Premier Division and maybe win a cup (or two) then next season, to have a season of stability at least as we adapt to the higher division. We also hope to add a ladies team to our 1st team and reserves and perhaps an U18 team too. We also definitely want to be a lot closer to our dream of playing in our own ground. Maintaining and growing our attendances would be brilliant too! * City of Liverpool FC play at the Delta Taxis Stadium in Bootle. Tickets are just £5 for adults and under-15s are free. Find the latest ticket info here, and give them a follow on Twitter @CityofLpoolFC.